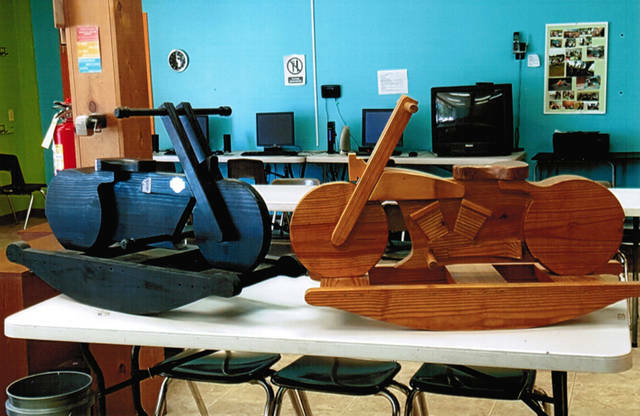 The Greenville Boys & Girls Club will have a raffle featuring two motorcycle rockers, which were homemade locally. GREENVILLE – The Greenville Boys & Girls Club will have its annual 127 garage sale on Aug. 2-6 at the club location at 613 S. Broadway, Greenville. People wishing to donate for the garage sale can drop off items at the club from 4-8 p.m. Monday through Thursday or Saturday from 1-4 p.m. In addition to its garage sale, the Boys& Girls Club will have its annual raffle. The raffle will be held Sept. 8. This year it will feature two motorcycle rockers, which were homemade locally and can be seen in the front window at the Boys & Girls Club. Tickets are $5 per ticket or five tickets for $20. All proceeds from the annual garage sale and raffle are used in sponsoring activities and outdoor field trips for the kids attending Boys & Girls Club. The Greenville Boys & Girls Club serves ids from 7-15 years of age, providing cooking classes, woodshop for arts and crafts, exercise room with weights and equipment, computers, video games, pool tables, ping pong tables and also providing outdoor activities such as fishing trips, baseball games and other variety of field trips. Annual memberships are $2 per year. The Boys & Girls Club is a nonprofit organization that accepts monetary donations and items to operate the club that can be tax deductible. Any additional information needed can be directed to Tom Jenkins, the director of the Boys & Girls Club, at 547-1122.